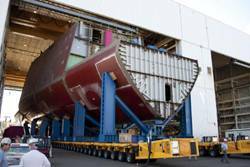 Maine shipyard workers guide one of four "Ultra Units" for DDG 1000, the lead ship of the Zumwalt-class of guided missile destroyers. Work on DDG 1000 is now over 50% complete. "This contract enables us to maintain a strong base of quality shipbuilding jobs in Maine and continue our contributions to sustaining the U.S. Navy fleet," said Jeff Geiger, president of Bath Iron Works. "It provides Bath Iron Works with a healthy backlog of work and reflects the Navy's continued commitment to the DDG-1000 program, as well as their confidence in our ability to build and deliver all three ships of this class." Geiger said, "Winning this work is a result of our commitment to operational excellence and to finding more efficient, affordable ways to operate in every part of our business. It gives us the opportunity to continue introducing new and innovative ways to build capable ships for the Navy. We appreciate all the support the Maine Congressional delegation has provided to this program. Their commitment to national defense and their advocacy on behalf of the workers of Maine has been a crucial factor," Geiger said. The first ship in the class, DDG-1000, is over 50 percent complete and is scheduled to be delivered in 2014. The DDG-1000 Zumwalt-class destroyer is the U.S. Navy's next-generation, guided-missile naval destroyer, leading the way for a new generation of advanced multi-mission surface combat ships. The ships will feature a low radar profile, an integrated power system and a total ship computing environment infrastructure. Armed with an array of weapons, the Zumwalt-class destroyers will provide offensive, distributed and precision fires in support of forces ashore. Work is already underway at the Bath, Maine, shipyard on DDG 1001 and DDG 1002. Congress previously approved funding for advanced procurement and initial construction of these ships. Bath Iron Works is the lead designer and builder for the program which employs approximately 5,400 people.